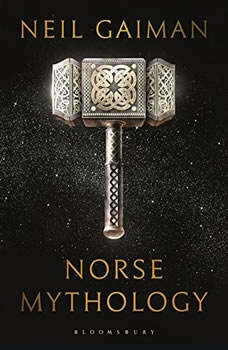 Introducing an instant classic--master storyteller Neil Gaiman presents a dazzling version of the great Norse myths.Neil Gaiman has long been inspired by ancient mythology in creating the fantastical realms of his fiction. Now he turns his attention back to the source, presenting a bravura rendition of the great northern tales. In Norse Mythology, Gaiman fashions primeval stories into a novelistic arc that begins with the genesis of the legendary nine worlds; delves into the exploits of the deities, dwarves, and giants; and culminates in Ragnarok, the twilight of the gods and the rebirth of a new time and people. Gaiman stays true to the myths while vividly reincarnating Odin, the highest of the high, wise, daring, and cunning; Thor, Odin’s son, incredibly strong yet not the wisest of gods; and Loki, the son of a giant, a trickster and unsurpassable manipulator. From Gaiman’s deft and witty prose emerges the gods with their fiercely competitive natures, their susceptibility to being duped and to dupe others, and their tendency to let passion ignite their actions, making these long-ago myths breathe pungent life again.Supplemental enhancement PDF accompanies the audiobook. A self-described "feral child who was raised in libraries," Gaiman credits librarians with fostering a life-long love of reading: "I wouldn't be who I am without libraries. I was the sort of kid who devoured books, and my happiest times as a boy were when I persuaded my parents to drop me off in the local library on their way to work, and I spent the day there. Gaiman began his writing career in England as a journalist. His first book was a Duran Duran biography that took him three months to write, and his second was a biography of Douglas Adams, Don't Panic: The Official Hitch Hiker's Guide to the Galaxy Companion. Gaiman describes his early writing: "I was very, very good at taking a voice that already existed and parodying or pastiching it." Violent Cases was the first of many collaborations with artist Dave McKean. This early graphic novel led to their series Black Orchid, published by DC Comics. The groundbreaking series Sandman followed, collecting a large number of US awards in its 75 issue run, including nine Will Eisner Comic Industry Awards and three Harvey Awards. In 1991, Sandman became the first comic ever to receive a literary award, the 1991 World Fantasy Award for Best Short Story. Neil Gaiman is credited with being one of the creators of modern comics, as well as an author whose work crosses genres and reaches audiences of all ages. Neil Gaiman writes books for readers of all ages, including the following collections and picture books for young readers: M is for Magic (2007); Interworld (2007), co-authored with Michael Reaves; The Day I Swapped My Dad for Two Goldfish (1997); The Wolves in the Walls (2003); the Greenaway-shortlisted Crazy Hair (2009), illustrated by Dave McKean; The Dangerous Alphabet (2008), illustrated by Gris Grimly; Blueberry Girl (2009); and Instructions (2010), illustrated by Charles Vess. His first collection of short fiction, Smoke and Mirrors: Short Fictions and Illusions, was nominated for the UK's MacMillan Silver Pen Awards as the best short story collection of the year. Most recently, Gaiman was both a contributor to and co-editor with Al Sarrantonio of Stories (2010), and his own story in the volume, The Truth Is A Cave In The Black Mountains, has been nominated for a number of awards. American Gods has been released in an expanded tenth anniversary edition, and there is an HBO series in the works. Gaiman was the first author ever to win both the Newbery Medal and the Carnegie Medal with the same book. "Twenty-three years ago, we lived in a little Sussex town in a tall house across the lane from a graveyard. We didn't have a garden, and our 18-month-old son loved riding a tricycle. If he tried riding in the house he would have died because there were stairs everywhere, so every day I would take him down our precipitous stairs, and he would ride his little tricycle round and round the gravestones. As I watched him happily toddling I would think about how incredibly at home he looked. I thought that I could do something like The Jungle Book with that same equation of boy, orphaned, growing up somewhere else, but I could do it in a graveyard. I had that idea when I was 24 years old. I sat down and tried writing it and thought, "This is a really good idea, and this isn't very good writing. I'm not good enough for this yet, and I will put it off until I'm better." The film adaptation of The Graveyard Book is in production.